Cheryl’s shopping expedition was inspired by this recent post by Luluaddict and this one. First things first, Ivivva is a children’s line and their current sizes are children’s 4-14. I am certainly not a child, nor am I a Lululemon size 2 or 4 and would not expect to fit into anything at that store except maybe a headband. My daughter is a tall 2.5 year old and we waltzed in looking for a pair of ‘base-layer’ tights for her to keep warm in. A quick glance thru the store brought us to the running luon rack and maybe it’s hereditary but my darling daughter decided that each piece was worth a pet. She didn’t whisper “my precious” but I’m certain that’s what she was thinking! I brought home a sz14 in the Running Luon item named “Warm’er LS Layer” and laid it out on top of a sz6 Lululemon Dash LS (Lilac) as well as a sz6 Lululemon Inspire pullover (Lilac). 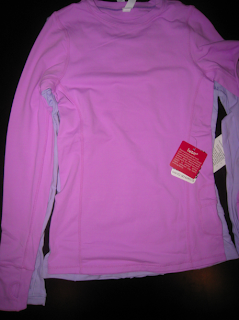 The findings are promising..
As you can see from the pictures, the sz14 Ivivva LS top is comparable to a size 4 or size 6 Lululemon Running Pullover. Even the sleeve length is comparable! My sister is a size 4 or 6 in all Lululemon tops and she hungrily snatched the sz14 Ivivva Warm’er LS Layer out of my hands when I asked her to try it on. She measures as a 34B and is app. 5’3″ tall and she found the sz14 comfortable and slightly roomy in the armpit. Later in the day she was able to try on a size 12 and felt that the fit was better for her arm length and more fitted (in a good way) to her shoulders. She intends to use it as a base layer on the mountains this Winter. When I lay out the sz12 to the sz14 (sorry, no picture at the moment for that.. my sister has run off with the shirt) but the noticeable difference is that the sz12 seems to be 3/4″ shorter and narrower all around. 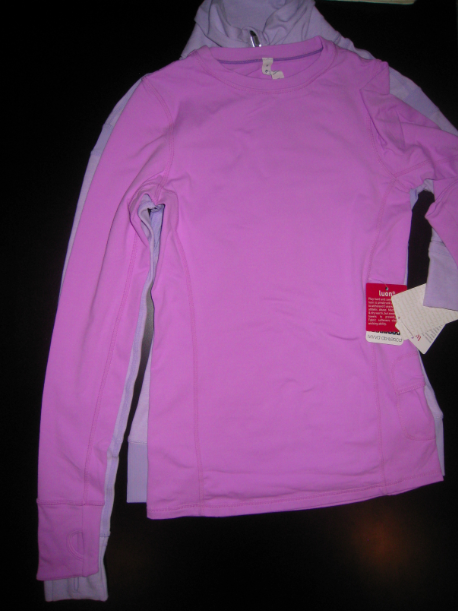 If your looking for a simple base layer other then the current wool offerings by Lululemon you would be lucky to check out Ivivva’s Warmer LS Layer..however, you need to be a Lululemon size 4 or size 6. How did my daughter like the running luon tights? Well, we picked out a completly different outfit for her instead and will save the running luon tights for next weeks visit. She’s already looking forward to it as I am. "Multi State of Mind Heart Tank"
"Candlelight Tank Multi State of Mind Print – Try on Report"